Creating great moments and promoting a healthy lifestyle amongst the staff of City Centre Bahrain. City Centre Bahrain, the largest shopping, leisure and entertainment destination in Bahrain, emphasizes the satisfaction and wellbeing of its staff, while creating great moments, for the third consecutive year by completing the ‘Lose for a Cause’ Contest amongst its staff members. The Contest this year, combined with a BD 10 donation for every kilograms lost during the contest, raised a total of BD 1,650 towards the Obesity Awareness Campaign organized by Bahrain Defence Forces Military Hospital. 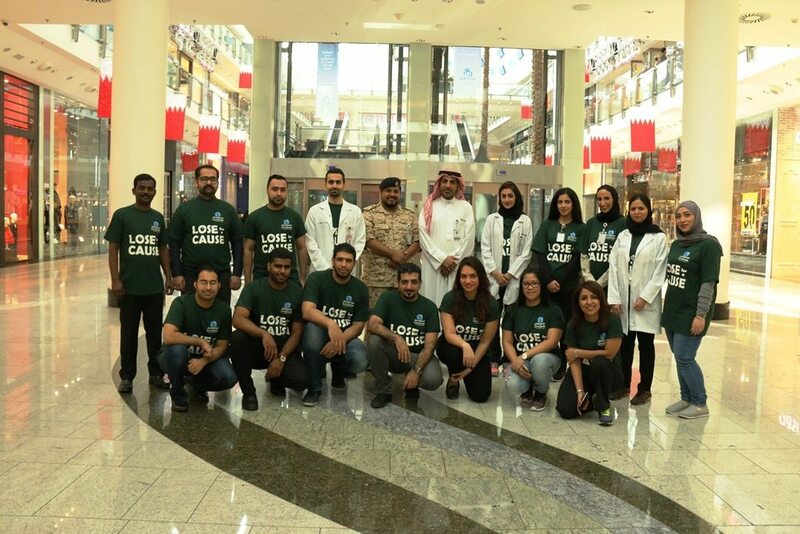 “The aim of the ‘Lose for a Cause’ Contest is to encourage and support City Centre Bahrain staff to live a healthy lifestyle and maintain their fitness level for a good cause. This year 16 staff members from both genders participated in the contest, which ran over 12 weeks. To motivate the participants and to ensure that the energy, and commitment, was kept at a high, we committed to donating BD 10 to the Obesity Awareness Campaign organized by Bahrain Defence Forces Military Hospital for every kilograms lost during the contest,” said Duaij Al Rumaihi, Senior Mall Manager, City Centre Bahrain. The City Centre Bahrain ‘Lose for a Cause,’ Contest commenced with a weigh-in on 3rd August 2015, with weekly weigh-ins held each Thursday thereafter on at the same time in the office, The progress tracking mechanics included measuring the percent of body weight lost on a weekly basis with the last weigh-in taking place on 26th November 2015. To motivate the staff who took part on the 12 weeks health initiative, City Centre Bahrain offered Gift Card prizes to the top three participants who lost the largest percentage of their body weights. City Centre Bahrain hosted an ending ceremony on 15th December, with all participants undertaking a mall walk and ending the initiative with handover of prizes. As part of its emphasis on creating ‘Great Moments for everyone everyday’ City Centre Bahrain’s ‘City Walkers Program,’ continues as a supervised energetic mini-exercises program that creates a fun atmosphere suitable for all age groups, with a certified fitness personal trainer on hand to motivate, train and educate participants with useful health tips. The City Walkers program takes places three times a week: Monday, Wednesday and Saturday from 9:00am-10:00am. To join the program interested walkers need to register at the Ground Floor Customer Service Desk and be ready to get fit! All participants also receive an exclusive ‘City Walkers’ T-Shirt after joining three sessions. There is no age limit or restrictions on joining the City Walkers program and it is completely free for residents. City Centre Bahrain is the largest shopping, leisure and entertainment destination in Bahrain, attracting more than 13.5 million visitors annually. Spread across more than 158,000sqm of retail space, City Centre Bahrain offers an international mix of more than 340 exclusive brands including 60 dining outlets, with major stores such as the Kingdom’s largest Carrefour hypermarket, Saks Fifth Avenue, Debenhams, Centrepoint, Pottery Barn and Home Centre. The mall’s integrated family leisure offer includes Wahooo! Waterpark, the Middle East’s first and largest indoor-outdoor waterpark, a 20-screen Cineco Cinema, and a Magic Planet. The mall is also adjoined by two premium hotels, the 5-star Westin Hotel City Centre Bahrain and Le Meridien Hotel City Centre Bahrain. A remarkable business success story, Majid Al Futtaim started from one man’s vision to transform the face of shopping, entertainment and leisure to ‘create great moments for everyone, every day’. It has since grown into one of the United Arab Emirates’ most respected and successful businesses spanning 13 international markets, employing over 27,000 people, and achieving the highest credit rating (BBB) among privately-held corporates in the Middle East. Majid Al Futtaim owns and operates 18 shopping malls, 11 hotels and three mixed-use communities in MENA, with further developments underway in the region. The shopping malls portfolio includes Mall of the Emirates, City Centre malls, and also four community malls which are in joint venture with the Government of Sharjah. The Company holds exclusive rights to the Carrefour franchise in 38 markets across Middle East, Africa and Central Asia, operating a portfolio of 65 hypermarkets and 85 supermarkets in 12 countries. Majid Al Futtaim operates 175 VOX Cinema screens and 19 Magic Planet family entertainment centres across the region, in addition to iconic leisure and entertainment facilities such as Ski Dubai and iFly Dubai, among others. The Company launched the first LEGO-certified store in the Middle East and is parent to the consumer finance company issuing ‘Najm’ and “Voyager” credit cards, a fashion retail business representing international brands such as Abercrombie & Fitch, AllSaints and lululemon athletica, and a healthcare business that operates a network of City Centre Clinics. In addition, Majid Al Futtaim operates Enova, a facility management company, through a joint venture operation with Veolia, a global leader in optimised environment resource management. The Company also operates in the food and beverage industry through a partnership with Gourmet Gulf.